In small bowl, mix Sauce ingredients. Cover and refrigerate until ready to serve. In shallow dish, mix coconut and bread crumbs. Spoon 1/2 cup thawed piña colada mix into small bowl. In another small bowl, mix cornstarch and salt. Working with 2 to 3 shrimp at a time, coat shrimp in cornstarch mixture, then dip into piña colada mix, then into bread crumb mixture, and completely coat, pressing lightly to adhere. In 4- to 5-quart Dutch oven, heat about 2 inches oil to 350°F. Add shrimp to hot oil; cook 2 to 3 minutes or until golden brown. Carefully transfer to paper towel-lined plate to drain. Serve immediately with sauce. To butterfly shrimp, place shrimp on cutting board, and carefully run tip of knife, without cutting all the way through, around outside of shrimp from head end to tail end. Open shrimp, and gently flatten with tail on top. When frying, use a thermometer to ensure oil is at the proper temperature. 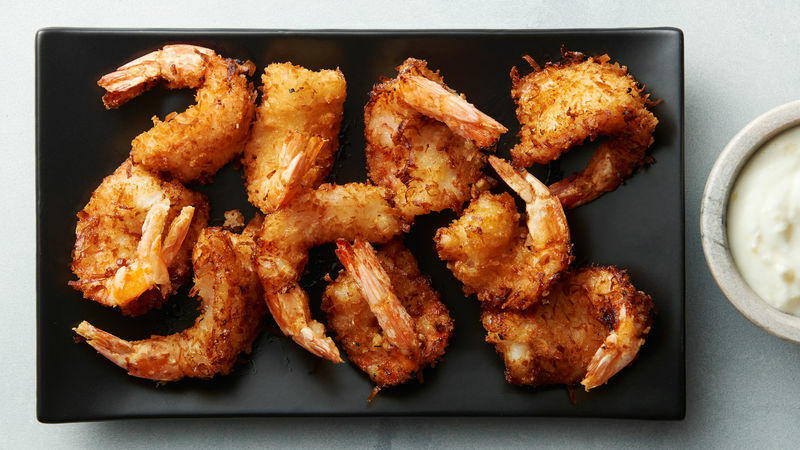 If the oil is too hot, the shrimp will brown too quickly. If the oil is not hot enough, the shrimp will absorb oil and have a greasy flavor.